Gardening Which? (complete with designer question mark) is The Consumer Gardening Magazine for British gardeners. The Moosey London team were kind enough to send me some copies - I'm very impressed! It's informative and serious, but didn't lower my gardening self esteem at all! 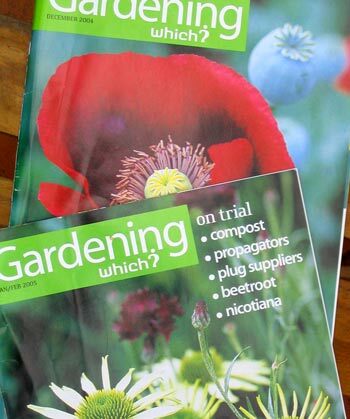 Consumer magazines can be quite daunting - they can make a humble gardener-reader feel guilty. There's something terribly responsible about using a 'good' rose spray, or an ergonomically sensible hand digger or an eco-friendly garden glove. Guilty gardeners who cheat (oops!) do not wish to be reminded of their sins by a magazine! Gardening Which? is nicely presented, beautifully colourful, and doesn't try and show off and be super-scientific. The photographs are great, advertising is non-existent, and the groovy newly designed question mark in the logo is obviously the editor's pride and joy. This magazine is practical rather than precious - and all the articles are very inspiring. It's also quite a nice size and thickness to read comfortably in bed!